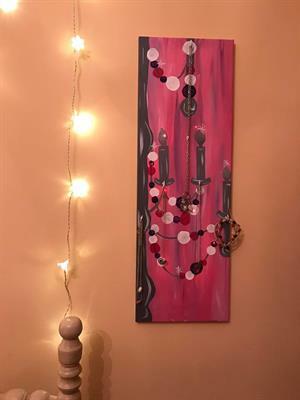 DIY Workshop Jewelry Holder/Painting "Chandelier"
What female doesn’t need a jewelry holder? Choose your background color as well as your chandelier color & paint away. When you are finished painting you will add 5 cup hooks on which you will be able to hang/display your jewelry. Great for your bathroom, bedroom or bedroom closet. We are so excited about this functional painting!